The Michigan Hawking Club hosted a west-side field meet this past weekend in Grand Rapids, Michigan. This is a gathering of falconers from across the state who help out not only with falconry adventures for folks in the club, but also by putting on a falconry program for the Boy Scouts. Several members of the club bring their raptors for an educational program for Boy Scouts interested in earning their “Birding Badge” in the boy scouts. The educational program is lead by a master falconer for the local boy scout troop and other falconers assist where needed with their birds by putting on additional demonstrations. Club members who are interested in additional falconry experience can go out with falconers for hunting expeditions in the morning and the afternoon. Our group went out early in the morning to a local hunting spot that was close to the Boy Scout center for a morning hunting expeidition. The hunting was difficult in the early part of the day due to the covering of snow that coated all the brush and trees in the morning. 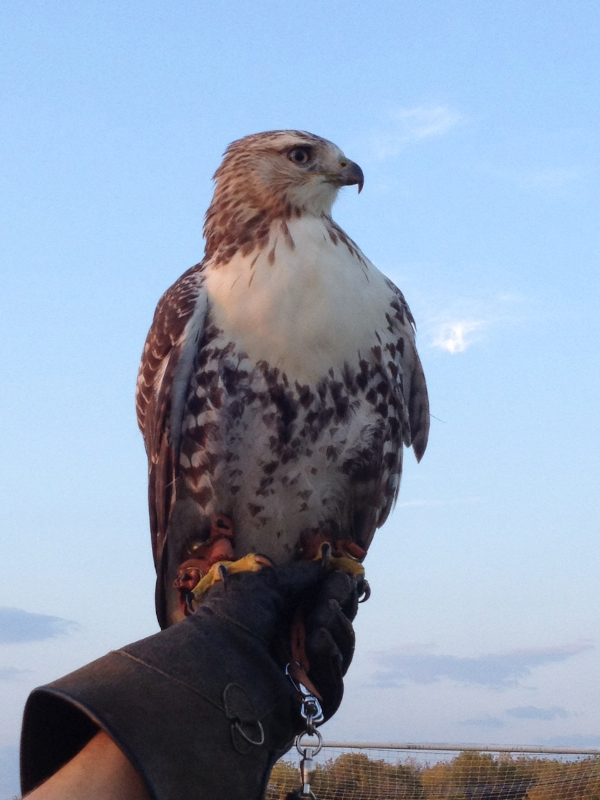 I flew Cedar for the group and she did extremely well for a young Red-Tailed hawk out for the first time with such a large group of people. 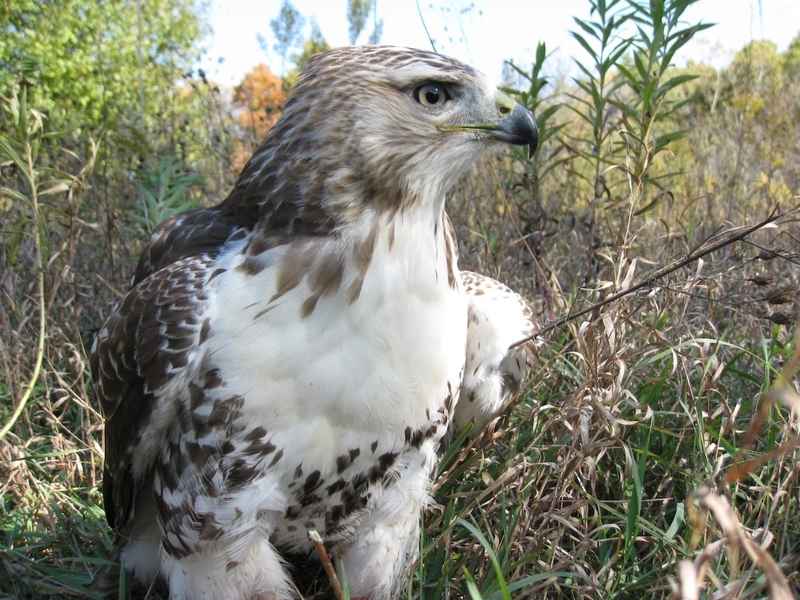 Typically, young hawks have difficulty hunting with large groups of people at first, as they are usually used to only the falconer in the field as a hunting partner. When you add an additional ten brush-beaters to the hunting party, the activity can sometimes get to be too much for the young hawk. Cedar followed along just fine and took several stoops at running cotton-tails in the early part of the day. She pulled fur on one and the morning came to a close for us. During one of my recent hunting expeditions, I was able to capture this short clip of Cedar returning to the glove for a tidbit. She has been hunting very well, taking stoops and dives on rabbits on each field outing. She follows the hunting party (usually me and another falconer) very well and responds to direction and encouragement while out in the field. I’m very excited for her progress and ability to follow and pay close attention while out in the field. 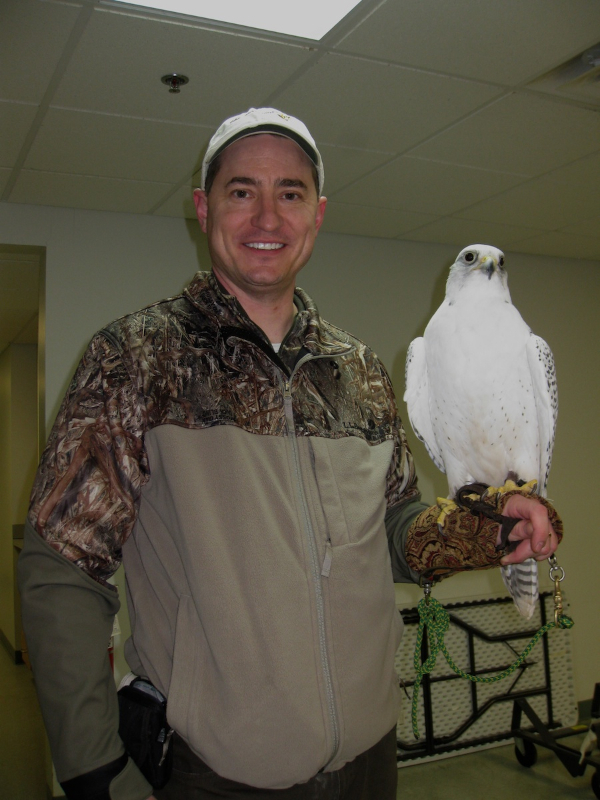 I was lucky enough to be able to meet this wonderful Gyrfalcon, named “Luna” this past weekend (below). With all the other falconers at the field meet this weekend, there were great opportunities to learn new things and to “talk hawking” with friends. 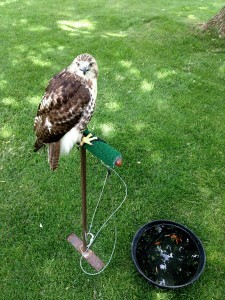 These meets are great for that, as well as getting to see and visit up close with different birds and learn about them. The past week has afforded several more hunting / training opportunities for Cedar. We’ve been able to get out to the field each day this week with the nice fall weather. Truthfully, the cooler weather, the better, as it is easy to work up a sweat hacking through the thick undergrowth. The early season for hunting in October is challenging with the leaves still on the trees and shrubbery still thick and standing. The dense undergrowth makes it difficult to walk through due to the green branches that have not dried out yet from the cold. These small thickets and densely covered areas are the key places where it is most likely to find game. Rabbits love to hide in the thick briar patches where there is food AND cover. It will take another three weeks or so for the leaves to fall completely to the ground in Lower Michigan. The leaves are already about half way done in the upper part of Michigan. The annual bird hunt weekend is scheduled appropriately in order to fall on a weekend at the tail end of leaves falling off the trees. This makes it much better for having good shots at grouse. These hunting excursions have been conducted in order to continue working on Cedar’s hunting ability and to get her out to fly each day. We continue to work on her hunting and falconry skills with the routine. Each activity should build on the next, and as much as possible, it’s the falconer’s job to provide that. In the case of actually finding game in the field, this is a little more luck than skill, unfortunately. Cedar has been extremely well behaved in the field, flying ahead to perches and moving along when called. I’m particularly impressed with her ability to pick higher perches and move up when appropriate. So far, she has the great beginnings to making a great falconry hawk. Stay tuned for more adventures. It took Cedar 15 days of manning and training to achieve first free flight and catch her first rabbit. To say I’m excited about this would be an understatement. 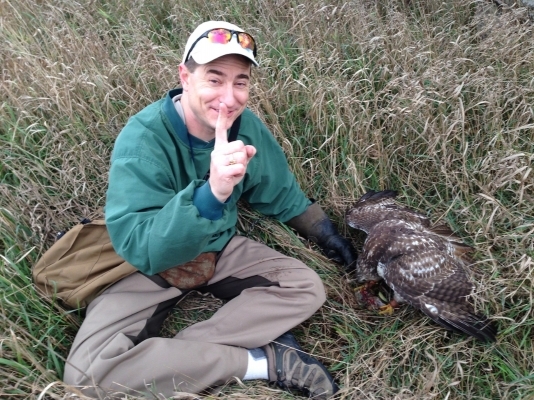 This is a wonderful start to what looks like it could be a great falconry season with a fantastic Red-Tailed Hawk. It’s hard to say just where training ends and hunting begins for these raptors, but I’m quite pleased with today’s progress in the field. The weather today was ideal for Cedar’s first free flight; light winds, cool temperatures, and a moderately cloudy /overcast sky. Not only was she great at following along through the trees, she was very attentive to the hunting area, and she was a successful hunter today. Very exciting! I’ll be sure not to get my hopes up too high, as each bird and each season can be different. Each season, hawk, and adventures bringing their own set of challenges. I’m sure glad to be back enjoying the fall weather with a feathered friend in the hunting grounds. Stay tuned for more hunting updates, it’s going to be a heck of a ride!